James Tarkowski is hoping to collect as many England caps as possible after joining up with international team-mates once again. The 25-year-old centre back was called up to represent the Three Lions for the first time in March, making his bow against Italy at Wembley having sat out the victory over the Netherlands. 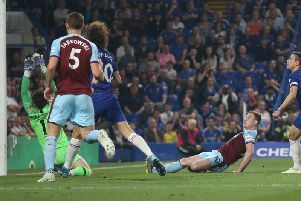 The Clarets defender, who featured on the left hand side of a central three against the Azzurri, alongside John Stones and Kyle Walker, has now been selected for Gareth Southgate’s first squad since the World Cup in Russia. England kick off their inaugral UEFA Nations League campaign against Spain tomorrow and then take on Switzerland in an international friendly at Leicester City’s King Power Stadium on Tuesday. After joining up with the group at St George’s Park earlier in the week, Tarkowski said: “I’m looking forward to it. It’s nice to get that call up again so I’ll turn up and see how things go. It’s always great to be a part of the set up, to represent your country. “From the first time I got called up it’s something that I’ve wanted to be involved in again. Every time I get called up it’s a great honour. I’m really looking forward to it. “It’s been nice and I’ve had a couple of camps now. I’ve been getting to know the lads, the staff, the people involved. Tarkowski was forced to remove himself from England’s stand-by list for the World Cup to undergo a hernia operation. He had been part of the five-man list alongside Clarets captain Tom Heaton as well as Adam Lallana, Lewis Cook and Jake Livermore. Meanwhile, Nick Pope was part of the group that made it to the semi-finals of the tournament where they were beaten by Croatia. “It doesn’t feel natural yet, I’ve only had one cap at the moment so it’s going to take a bit more time,” Tarkowski said. “I’ve really enjoyed doing it, as have all the lads that have met up with the squad. “I want to get as many caps as I can but just to be a part of it is a great privilege. I’m just looking to improve as a player and with the players that you’re around when you’re there - the quality among some of the best players in this league - it’s a great privilege to be here. Tarkowski endured short term pain for what he hopes is long term gain, withdrawing from the standby pool ahead of the World Cup, to ensure he was fit and ready to attack this season: “Obviously it was a disappointment. “Anyone missing out on the World Cup would be disappointed but I knew the position I was in and something needed to be doing in July so I just thought I would bite the bullet, as they say, and it got me right so I started the season well and got back into the squad. “I was just a fan, I spent a lot of time with my friends watching the football. I enjoyed what I was watching, it was a great time to be an England fan and there was a great atmosphere around the country, so even to be a small part of that squad was a great opportunity. With England having been so successful with a back three in Russia, there are more slots than there could be open for Tarkowski to break into, and he added: “If there is an extra spot available, obviously it gives me a better chance to be part of the squad. “I quite enjoyed the game I played in a three at the back against Italy and so I don’t think it is something that will go against me, if there is an opportunity for a spot there for me, I am going to try and take it. “I think it is pretty obvious with how well the lads did in the World Cup that they were the three lads who played throughout and did well so they have got those positions.